A-HOTEL.com - Luxury and cheap accommodation in Obukhovka, Russia. Prices and hotel, apartment booking in Obukhovka and surrounding. Scher Hof offers rooms in Azov. Among the various facilities of this property are a seasonal outdoor swimming pool, a garden and a bar. Soho Grand Hotel offers accommodation in Azov. Guests can enjoy the on-site restaurant. Overlooking the River Don, AMAKS Azov Hotel is located in Azov city centre. A fitness centre, and a large restaurant are available on site. Offering free WiFi and city views, Apartment Leningradskaya is an accommodation set in Azov. This property is 1. Boasting city views, Мира д 43 кв 8 provides accommodation with a balcony, around 1.4 km from Azov Bus Station. Featuring free WiFi, Guest House Prestige offers pet-friendly accommodation in Azov. Free private parking is available on site. Hotel Rogozhkino is set on the beachfront in Rogozhkino. Among the various facilities of this property are barbecue facilities, a garden and a terrace. Donskaya Roscha Park Hotel is located in a green area, on the bank of the Don River. It features a 24-hour reception and an elegant lounge bar. Set in Rostov on Don in the Rostov region, улица Малиновского 18 features a balcony. Housed in a building dating from 1980, this apartment is 9 km from Rostov Main Bus Station and 14 km from Rostov Arena. Featuring free Wi-Fi, a kitchen and 24-hour reception, this aparthotel is located in the South-Western suburb of Rostov-on-Don city, 200 metres from the Don River Embankmet. Each apartment at Dobroslawa ApartHotel is decorated in neutral colours and includes a flat-screen TV. Set in Rostov on Don, 10 km from Rostov Main Bus Station and 17 km from Rostov Arena, Apartment offers air conditioning. This apartment features accommodation with free WiFi. Offering a sun terrace and sauna, Hotel Favorit is located in a quiet area of Rostov-on-Don, a 10-minute drive to the Don River. The city centre is a 15-minute drive away. This hotel is located in Sovetsky District of Rostov on Don and offers free parking. Free Wi-Fi, karaoke, a sauna and a 24-hour reception are featured at Metropol Hotel. Free Wi-Fi and paid private parking are provided at Alfa Hotel is located in the western suburbs of Rostov-on-Don city. Zolotoy Vavilon Shopping Mall and Fortuna 1 Car Market are 2 km away. Indigo Hotel is located a 5-minute walk from Zolotoy Vavilon shopping centre in Rostov-on-Don. It features a sauna, karaoke and massage services. 1-KOM STACHKI-ZHMAILOVO offers accommodation in Rostov on Don, 8 km from Rostov Main Bus Station. Guests staying at this apartment have access to a fully equipped kitchen and a balcony. 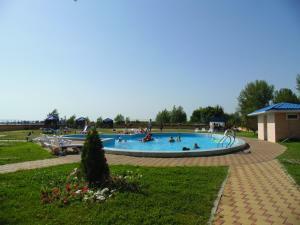 Situated within 10 km of Rostov Main Bus Station and 15 km of Rostov Arena, Chalet Rostov offers rooms in Rostov on Don. The property is located 13 km from Rostov Academic Drama Theatre and 16 km from Rostov Bus Station - Local Destinations.